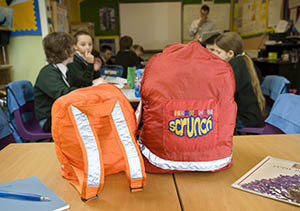 The SMARTSACK Scrunch™ was designed by two practising teachers. They were looking for something to help with easy identification of pupils while on SCHOOL TRIPS and to allow pupils to carry materials for OUTDOOR LEARNING. 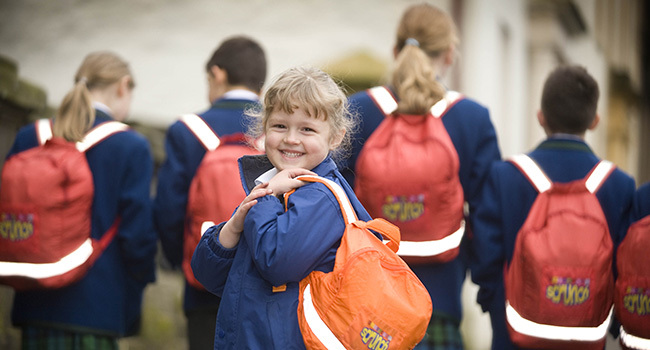 The clever design has HIGH VISIBILITY STRIPS and will allow pupils to be clearly seen from a distance away. The Scrunch can be easily stored away as it folds up into its own carry pouch. The Scrunch is also exceptionally light weight and durable and we are confident that schools and nurseries will see it as a great value product that will assist outdoor learning (in a safe way) – very important in the modern curriculum. It comes in two sizes to accommodate all ages. They are very helpful because we all used to argue over who had a big or a small chair, but thanks to names on our Smartsacks we don't any more ! I THINK OUR SMARTSACKS ARE GREAT ! What if the SMARTSACK™ won’t fit my school chairs? How sturdy is the SMARTSACK™ material? Is the SMARTSACK™ available in different colours?